Except where the climate is such that long periods of hot dry weather without rain or heavy dews may be counted upon, sun drying is uncertain unless some means is taken to provide protection from occasional showers and also from blowing dust, insects, etc. A contrivance of this kind is shown in the illustration. 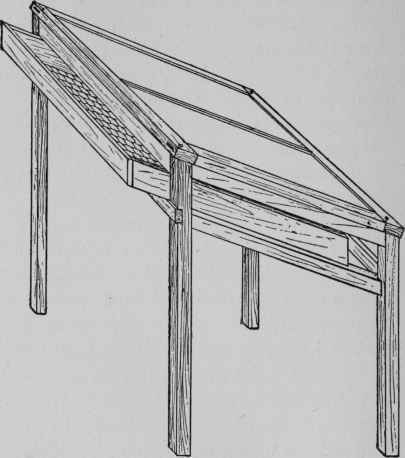 This shows a frame covered with a "Baby" or "Junior" sash, such as are used in many home gardens. A larger-sized drier can be made to accommodate a standard cold-frame sash; or if one has a suitable place for doing the work the products may be simply spread in the bright sunshine under cover, on pieces of muslin or paper. Drying may be done in trays alone, of convenient size for the product to be handled, but this process will necessitate much more careful watching, covering up, etc. Fig. 13 - A home-made frame drier with glass top. The removable tray or drawer has a fine mesh wire bottom. The heat of the cook stove can be used-often in connection with cooking - so that no additional expense is necessary for fuel, for evaporating. The simplest equipment for this work is the use of large plates or pans in the oven, with the door open, or at the back of the stove. These, however, are inconvenient and risky. It will be better either to get a commercial drier or to make one at home similar to that illustrated. 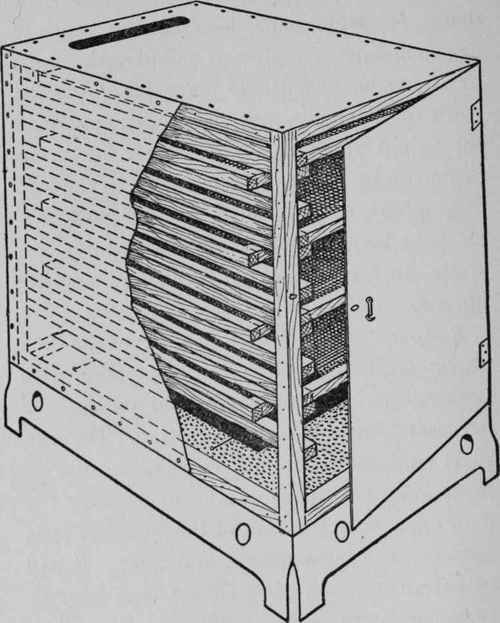 This is merely a box on metal legs, containing a number of light trays, which may be set upon the stove, the heated air passing up through the trays and around the product. There are many other inexpensive driers on the market for use over coal or gas stoves; the smaller sizes may be bought for a few dollars each. Before attempting to make a home-made drier, one should be satisfied that he cannot find among these something which would serve the purpose better than a home-made affair, at little or no more cost, all things considered. Fig. 14 - A home-made stove drier with removable wire tray or rack. Outside is covered with metal. Fig. 15 - A convenient type of small stove drier. For this purpose, in the home an electric fan Is usually made use of. This has proved very efficient, provided suitable trays for keeping the products separated, so that the air-cur-rent will pass through them most effectually, are arranged. The effectiveness of the fan method of drying as compared to hot air over the stove will be surprising to those who try it for the first time. The cost of running the fan in many instances will be but eight to ten cents a day. Many things can be dried sufficiently within a few hours. The arrangement of the fan and trays is shown in the accompanying illustration. The fan where used is likely to prove more satisfactory than heat drying, the color and flavor being better preserved, and the product more uniformly made.